We’ve been blogging about coolers since 2015 and have talked about A LOT of ice chests. In that time, we have compared just about every major cooler we’ve reviewed with Yeti and touted them time and again as the industry standard for what a premium cooler should be, at the very least. And yet, in all that time, we haven’t really fully discussed the Roadie itself! We mentioned it many times, we blogged about its pink edition but a full review? Nope. Well, so here is our Yeti Roadie 20 review, for all it’s worth. Better late than never, right? As you probably know from the song we’ve been singing nearly every post, Yeti is an industry leader. It is the most well-known cooler manufacturer in the country, and its popularity has pretty much risen to cult status. 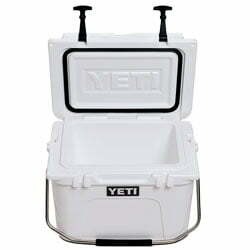 Before Yeti came onto the scene, the cooler was no more than a utility for keeping your food and beverages cold. It wasn’t fancy, and it certainly wasn’t something you would go boasting to your friends about having. It was something necessary that did a necessary job, and so you bought one when you needed one. When Yeti came, the cooler transformed before our very eyes. It turned the cooler into an object of desire and a fashion statement. We’ve reviewed lots of Yeti products, including the Tundra series, which the Roadie 20 is a part of. Most recently we covered the Yeti Tundra Haul. 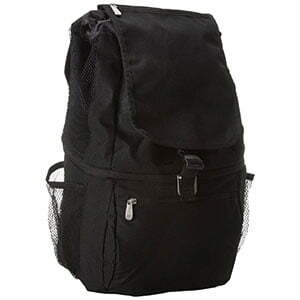 However, we have never really dedicated a review to the Roadie, which has a cult status among Yeti products. That’s what we’re going to do today. The Yeti Roadie 20 is Yeti’s fun size cooler. It’s the kind of cooler that you take a BYOB party. In fact, that’s why Yeti tout it as BYOB’s new best friend on their website. Have you ever noticed that most manufacturer’s in just about any industry you can think of, have a bestseller product? Every computer company, every film company, every phone company, and every cooler company, of course. They all have that one model that seems to be everyone’s sweetheart; not just to their dedicated fan base, but also to outsiders who even associate the company and the brand as a whole with that particular product. In the case of Yeti, that bestseller is the Yeti Roadie 20. This little cooler is just the right size. It can carry up to 14 cans of beer if you maintain a 2:1 ice to content ratio and has such great insulation power that it almost seems to defy the laws of thermodynamics. We fell in love with this cooler, and while it certainly doesn’t come cheap and might make you grumble protests as you fork out over $200 to purchase one, it certainly feels worth it once you start using it. As you would expect of a premium cooler, this Yeti hard cooler is rotomolded. Rotomolded coolers are the crème de la crème of the cooler world. They are made in one piece, meaning there aren’t any seams or weak joints. Because of the lack of joints and the one-piece construction, their insulation capabilities are phenomenal. They retain ice much longer than lower quality multi-piece constructed coolers. Another advantage of a rotomolded cooler is that it is very strong and durable. This is the kind of cooler that takes a hit and keeps going. While not all of them come with a lifetime warranty, you can expect them to last you a lifetime; at least the body of the cooler will last you a lifetime; it might even last you two! The simple design on the Roadie is like that of other Yeti hard coolers. It’s a simple box design with the Yeti staples: a strong lid, T-Latches, a drain plug, and non-skid feet. It also comes with a single steel handle on the top. 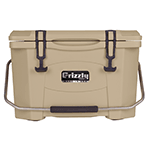 It doesn’t have any other handles because the size implies that this cooler should be light enough to be carried with a single handle looping over the top. The lid has a very strong gasket that ensures all of the heat remains outside of the cooler, and the cold remains inside. As for the insulation on the inside, it is commercial grade polyurethane, which is known to be among the best forms of insulation in the market, retaining your ice for long periods at a time. The T-Latches are pretty easy to operate. You just pull them off to undo them and then press them back into their holdfasts when you want to lock your cooler. For all the ease with which they’re operated, however, these latches are very strong and will keep the lid firmly closed. It’s important to point out at this point that the walls of the Roadie are designed in the FatWall style that all of Yeti’s hard coolers share. They are extra thick, allowing them to hold up to 2 inches of foam insulation. More insulation means better retention and the Roadie lives up to this in a remarkable way. The features on the Yeti Roadie 20 are great and pretty much what you would expect from a Yeti hard cooler. They aren’t really anything new; it’s how well they do their job, however, that makes the Yeti Roadie 20 really stand out from the competition. 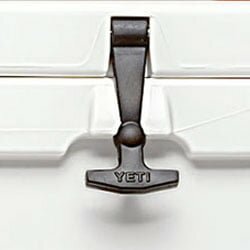 To start with, the Yeti Roadie 20 comes with AnchorPoint tie-down slots for easy mounting, whether you’re going to be mounting it on a truck bed, a trailer, or a boat. These slots allow you to firmly tie the cooler down so the contents don’t get thrown around when you’re driving on rough terrain or braving especially rough waters. The lid has an interlocking lid system, which is form fitting for extra protection against the heat coming from the outside. Moreover, the hinge at the back consists of not one but two hinge pins to complement the interlocking design. That means it’s virtually impossible for the hinge to be broken. A stronger lid means better ice retention. Underneath the lid is a high-quality ColdLock gasket that circles the lid’s length. This gasket is pretty efficient when it comes to keeping heat out and locking the cold in. The lip also extends slightly out too provide the LipGrip Handles, which basically give you another option for carrying the roadie 20. 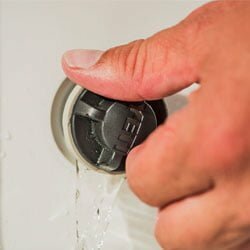 When it comes to drainage, the Vortex drain system is rugged, leak-proof, and made to allow for the fastest and easiest drainage you ever saw. Finally, at the bottom, are the BearFoot non-slip feet which keep your Yeti from sliding on an uneven surface. 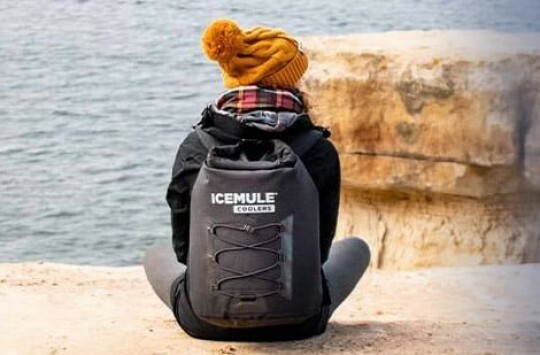 The Yeti Roadie has superior ice retention because of its great design and insulation. Yeti aren’t clear on how long it’s supposed to retain ice. 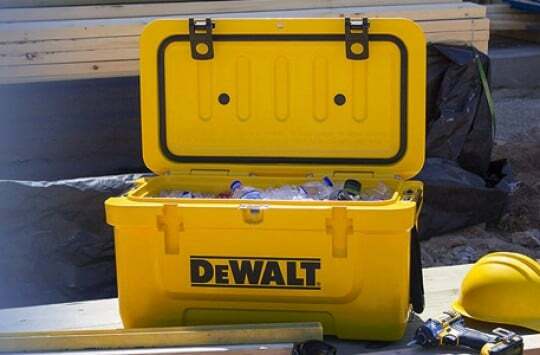 However, based on our independent tests, this cooler will easily retain your ice for up to 6 days at a time. That’s better than what you get with most other coolers of the same size. 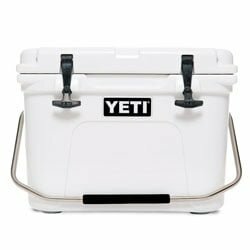 Who is the Yeti Roadie 20 for? The Yeti Roadie 20 was built for portability and, as such, was made for people who want a nice portable cooler they can take to their tailgates, picnics and road trips. Your drinks stay forever cold, and your trip, party, and picnic stays forever fun. The fact that the insulation on the Yeti Roadie is 2.5 inches while regular cooler insulation is an inch thick is something to marvel at. The extra inch and a half of thickness basically means you’re going to get a lot more ice retention than you could ever get with a regular cooler of the same size. 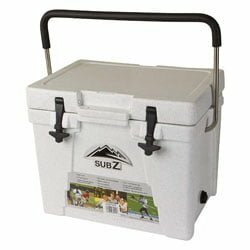 Throw in the fact that this cooler is rotomolded and you basically have a portable fridge that doesn’t need to be plugged in. For starters. We didn’t like how hard it can be to carry the cooler using the overhead metal handle, especially when the cooler is heavy. For such a small cooler, the Yeti Roadie 20 can be a pain to carry, even when it’s empty. The metal handle is pretty narrow as well, which means it can hurt your hand when carrying the cooler at full capacity. Another thing we didn’t like was how hard it can be to move the handle in and out of its position when it is locked upright. Sometimes we literally had to kick it out of position. Something we found a little weird, though we didn’t necessarily hate it, is the fact that the thick walls are so good at their job that even hours after you’ve drained the cooler it’s still very cold to the touch. 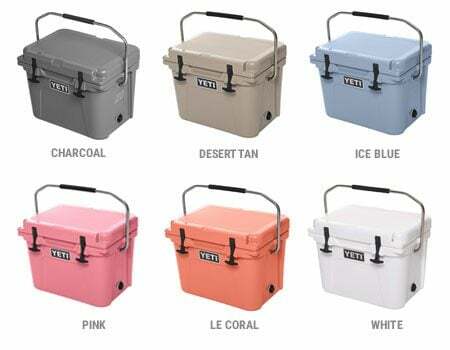 There are 6 available colors for this cooler: Charcoal, White, Ice Blue, Desert Tan, and LE Coral. Oh, and there’s a Pink Yeti Roadie, and actually there’s a good reason on why it’s pink. This product comes with a warranty of 5 years from Yeti. However, given its durability and great functionality, we strongly believe it could last you a lifetime if well maintained. 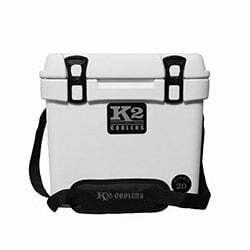 The K2 Summit cooler isn’t your average cooler, as we found out when we reviewed it. The ice chests are rotomolded, which makes them as premium as any premium cooler out there. The outer walls are pretty thick and strong while the insulation on the inside is a quarter inch thick plastic insulation. The clincher, however, is the high density polyurethane foam insulation on the inside that tops out at 3 inches thick. 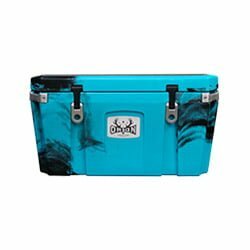 This cooler also comes with other great features, such as compatibility with dry ice, resistance to UV rays on the outside, and multiple color options. 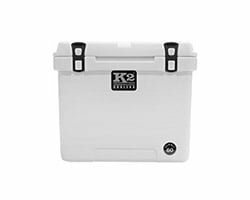 When we reviewed this cooler, our main headline was the question about whether the Yeti Roadie had finally met its match. 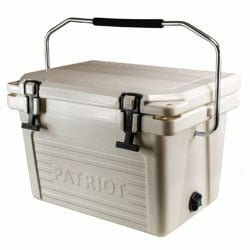 This cooler has a capacity of 23 quarts and happens to be made in the USA. The Yeti Roadie 20, on the other hand, is manufactured in the Philippines. The Nash Sub Z is also much cheaper than the Roadie. It also comes with a high top chair that you can attach to the lid for free. That’s something you would have to pay a lot more for on the Roadie. The walls on the Nash Sub Z are 1.5 inches thick while the high density foam insulation on the inside is 2 inches thick. It’s also much lighter than the Yeti; up to 40% lighter. It also comes with plenty of color options. This is a cooler we actually haven’t reviewed yet. We’re planning to do that in a future post. 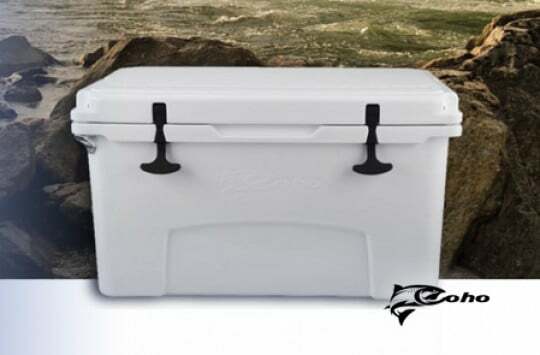 Meanwhile, based on reviews by users and our inspection of the cooler specs, we think it’s a great cooler and could provide some good competition for the Yeti Roadie. We’ll get into the details in our next post when we do a proper review of it. The simple answer is that you can buy the Yeti Roadie 20 on Yeti’s website. 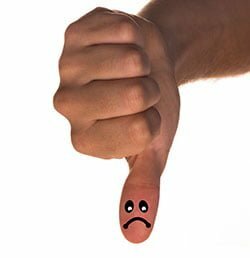 However, we would recommend that you make your purchase on Amazon, or at least check for actual user reviews before you buy anywhere else. Yeti happens to have its own store on Amazon, so it might be convenient to get one from there, considering some benefits you might get. What benefits are we talking about? Well, On Amazon you get buyer protection, money back guarantees, real reviews, and one day delivery in some cases, among others. And with that, we end our Yeti Roadie 20 review. As you can see, this awesome little cooler deserves its cult status. Should you get one? Well, if you really need a Yeti for the road, then the Roadie would be perfect for you.